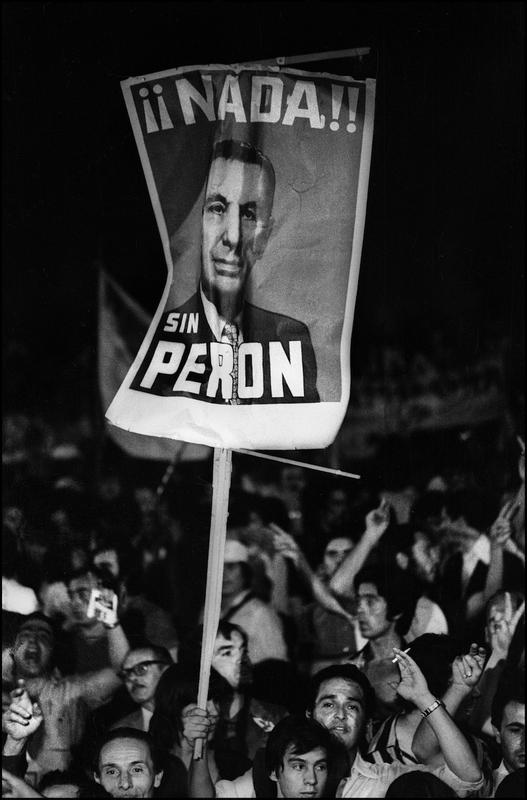 This exhibition comprises one hundred and fifteen mostly never-before-seen photographs concerning Juan Domingo Perón, one of the most famous—and polemical—populist leaders in Latin American history. The works in this show differ from other photographs of the political leader because, firstly, they were taken by a female photographer. Sara Facio was a photojournalist working for the French agency Sipa Press in the early 1970s, a time when there were virtually no Argentinian women working in photojournalism. Secondly, these pictures were chosen from thirty-one rolls of film that were left in the bottoms of boxes in the artist’s archives for decades; Facio eventually grew more interested in portraiture and photographic essays than in journalism and documentary. She did not bring these photographs to public attention sooner in order to not “take advantage of the country’s political context”—the most recent period of Peronist governments in Argentina came to an end in 2015. Facio is reluctant to engage politics head-on: She does not consider herself an activist or a Peronist. She simply sensed that what she witnessed in Argentina in the 1970s was historic and worth documenting. Although an insightful distance makes itself felt in these images, her point of view is sympathetic to the people; unlike the aerial views of the masses taken by the press photographers covering politics and the Casa Rosada, Facio’s vision of the marchers near the Plaza de Mayo is captured on the ground, up close. Peronism has been born, has died, and has been reborn over the course of decades. These works portray the fanaticism occasioned by a political leader’s return to his country in 1972 and the wails unleashed upon his death in 1974. Chaos, violence, resistance, utopia, struggle, hope, bloodshed, sorrow, darkness—those are the words that describe Argentina and South America as a whole in the years immediately before the long night of military dictatorship set in. Translated from Spanish by Jane Brodie.